In some parts of the country, fungi may be a more important structural pest than termites. The “Dry-Rot” Fungi are plants that lack chlorophyll, and since they cannot produce food carbohydrates, they live on lumber products. Fungus consists thread-like strands caked hyphae. These aggregate into masses called mycelium. In the decay “Dry-Rot” Fungi, the mycelium is flat and fan-shaped. This mycelium may be the first evidence noticed when a fungi infection occurs. The decay fungi thrive in a dap location. Wood is subject to decay in a damp atmosphere where moisture cannot evaporate easily. Decay does not occur when wood is completely dry or where it is completely saturated with water. Water shuts off air which the fungi needs to grow. Mycelium gives rise to the fruiting body of the fungi. The fruiting body bears enormous numbers of spores. These spores are microscopic in size. Their function is similar to that of seeds in the higher plants. Fungus has the ability to produce rhizomorphs, which are root-like growths. These rhizomorphs function as moisture conducting tissue. They make contact with damp soil or moisture producing sources and hasten the development of the fungus body. They are the cause of fungus being able to thrive many feet from a source of moisture. Lumber attacked by fungi has a brownish discoloration and presents a crumbly appearance. It may appear to consist of pieces of square or rectangular wood and often is referred to as “brown cubical rot”. The fungi bores through cell walls in the wood by means of enzymes which reduce the lignin and cellulose of cell walls, thereby causing the wood to disintegrate. Moisture below 20% inhibits growth. Moisture content below 8% kill fungi in 24 hours. Fungi may remain dormant for years when moisture source is cut off. If moisture reoccurs, fungi will become active. Does not occur when wood is completely saturated. Optimum temperature is 72 degrees. Maximum temperature for growth is approximately 80 degrees. Temperatures above 115 degrees will kill fungi. Low temperatures will retard growth of fungi. Growth will resume when temperature is raised. Wood may appear free of fungi but if it has been infected with fungi spores, when returned to proper environment, the fungi will become active and grow. This accounts for some fungus appearing as a result of sweating pipes and window sashes. 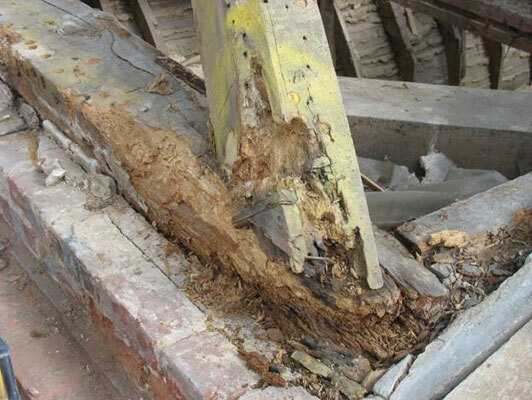 Vapor from soil in hot humid climates can impart enough moisture on joists ends to cause fungus. Do You Have A Signed Contract? Do You Want Your Report Sent To Your Real Estate Agent? Will This Property Need A Termite Inspection?